Workers' Compensation is a rapidly evolving issue affecting pension administrators. The Workers’ Compensation Fact Sheet offers an excellent discussion to provide you with a basic understanding Workers' Compensation issues. New Jersey Administrative Code (NJAC 17:1-4.39) covers employer obligations under Workers' Compensation awards. For pension purposes, there is no distinction between temporary and permanent Workers' Compensation awards. Recent court rulings have held that an employee who receives Workers' Compensation benefits must be retained on payroll. The employer may be responsible for remitting pension contributions on behalf of the employee. The employee has sufficient service credit to be eligible to receive a disability retirement allowance. If the employer ceases remitting contributions because the employee voluntarily resigned or was terminated for reasons unrelated to the Workers' Compensation award, the employer must notify the NJDPB by correcting the Quarterly Report of Contributions (ROC). In accordance with normal policy, if the correction covers prior period adjustments, a detailed letter should be sent to the Audit/Billing Section under separate cover and the employer should attach appropriate supporting documentation, such as the Workers' Compensation award, letter of resignation, and/or termination agreement. Specific issues that pertain to NJ State-administered pension system reporting and contributions are addressed below. Lump-sum payments for medical expenses and/or "damages" are not considered pensionable, therefore, are not reported to the NJDPB. Only "periodic" payments intended to replace lost wages are pensionable. Often, a portion of these awards are paid in a lump sum to cover wages lost over a specified period of time in the past. In this case the employer would report the pensionable portion of these payments in the same manner as with a "retroactive salary increase." 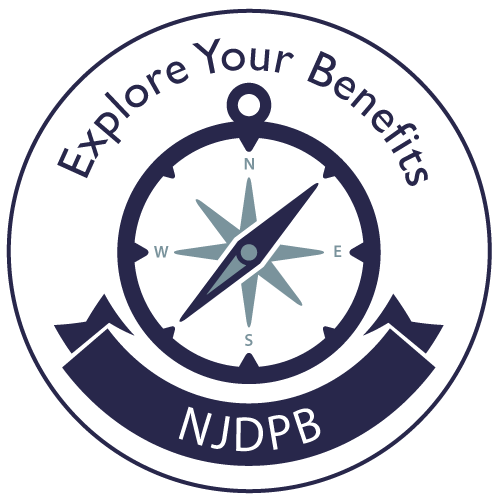 Unless otherwise stated in the award, the salary used for remitting and reporting to the NJDPB is the salary the member received immediately before the receipt of Workers' Compensation benefits. Workers' Compensation Awards "With Pay"
If an employer keeps an employee on regular payroll and the insurance company pays the employing location (not the member), then the employee is responsible for all deductions, including the continuation of loans and arrears. It is as though the member is still active in all respects for pension purposes. Full contributions/repayments would be remitted monthly, and full service credit, salary, contributions, and other deductions would be reported quarterly on the ROC. If a periodic Workers' Compensation award "with pay" is for only a percentage of the member's regular salary, the member still contributes the normal amount of pension deductions and is reported at full base salary on the ROC. Some employers augment a Workers' Compensation award that is for less than the full base salary. When an employer augments or compensates for the remaining portion of the member's full salary, the member is treated as "with pay," meaning the member's full contributions and regular deductions are withheld from the employer's salary payment and the full salary and deductions are reported on the ROC. For example, an insurance company pays a Workers' Compensation award of 70 percent of base salary directly to the member. The employer elects to augment the award amount by the remaining 30 percent of base salary. The employer would deduct pension contributions and repayments (loans, etc.) for 100 percent of salary from the 30 percent check. When an employee returns to work from a Workers' Compensation leave, the employer should send an email with “Workers' Compensation for (the member’s name)" in the subject box. The email should include the Employer Location Number and the member’s period of Workers' Compensation and date returned to work. Until the DB & DC Plans Unit is notified, it is unaware that an absence is Workers' Compensation-related and/or whether service credit is due for any absences. Upon receipt of notification of the Workers' Compensation-related absences, the employer (Centralized Payroll or Local Employer) is billed for the pension due for the creditable time period and the corresponding service is credited by an Auditor in the DB & DC Plans Reporting Bureau. As the Employer, it is pertinent for you to report the events timely and not to wait until a member is going to retire to inform the NJDPB of any missing service due to Workers' Compensation events. Workers' Compensation billings and service credits are processed quarterly, usually a couple weeks after posting, with the exception of employees with retirement processing pending. As a result of the quarterly lag time, processed Workers' Compensation credits may not be available for four to six months after the quarter in which they return to work is posted. Timely reporting of Workers' Compensation leaves ensures members the more timely posting of service and salary information. Workers' Compensation Awards "Without Pay"
If the only payment the employee is receiving is a check directly from the insurance company, this is considered Workers' Compensation "without pay," and the employer is responsible for paying the member's normal pension contributions and mandatory back deductions. Full contributions would be remitted monthly, and full service credit, pensionable salary, and contributions would be reported quarterly on the ROC. The employer is not responsible for voluntary payments such as loans, arrears, and SACT contributions. If the periodic Workers' Compensation award "without pay" is for a percentage of the member's regular salary, the employer will still remit the full monthly pension contributions on behalf of the member and report the full base salary on the ROC. If a Workers' Compensation award is "with pay," the PERS or TPAF member is considered to be active in all respects for pension purposes. Contributory Group Life Insurance deductions from the member's salary will continue as normal. For PERS members covered by Workers' Compensation "without pay," the member is considered "inactive" for purposes of group life insurance coverage. The employer is obligated to inform the employee of the requirement that group life insurance premiums must be remitted to continue coverage. The member must then make arrangements to pre-pay the regular premium for contributory insurance. Payments may be sent directly to the NJDPB, or the employer may elect to allow the member to pay the location that would then forward the premium to the NJDPB through regular monthly TEPS transmittals and report these premiums in the usual way on the ROC. It is the PERS member's responsibility to remit payments in advance, either by direct payment to the NJDPB or by payments made through the employer (who would forward the premiums to the NJDPB through TEPS), or face the termination of contributory insurance coverage. Premium payments must be remitted with a Personal Life Insurance Remittance form. TPAF members who receive Workers' Compensation "without pay," or have an approved leave of absence for medical reasons, continue to be covered by contributory life insurance. The contributory insurance premium is paid for by the State and is not required of the member. When an employee has a Workers' Compensation award pending, or is receiving periodic benefits under Workers' Compensation or the Second Injury Fund, the employee is considered active in all respects for health benefits coverage. Health benefits coverage will continue in force for the employee and all eligible dependents covered under the employee's coverage level selection. If the employee is receiving Workers' Compensation "without pay," he or must pay the employer in advance for his or her share of the health benefits premiums. If the Workers' Compensation award is "with pay," the premium share may continue to be deducted from the employee's paycheck.